9th Creation - Superheroes. Vinyl LP. Bleep. 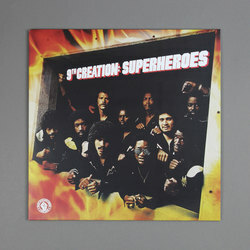 With thanks to Past Due Records, 9th Creation’s 1979 Superheroes returns to vinyl, cementing their place as one of the greatest overlooked funk bands of the 70s. Having ditched Prelude Records due to poor promotional support, principal composer J.D. Burrise brought the 10-piece band back to the studio to record this maniacally funky album, later releasing it under his own label Burrise Way Productions. This perfect blend of West Coast soul, disco and funk is worth every bit of your attention.